Delicious, buttery puff pastry is stuffed with creamy goat cheese and sweet persimmons in this tartlet recipe. A tasty bite-sized appetizer for your next holiday platter. Hello there! Today’s recipe is a cute and delicious appetizer that uses fuyu persimmons, a sweet fall and winter fruit! It’s easy to put together, uses few flavourful ingredients, and is perfect for serving at a party or get-together! 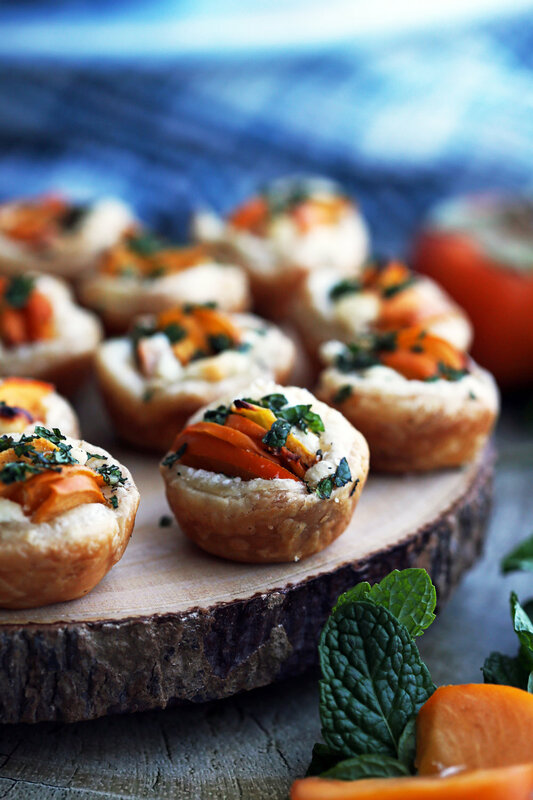 I hope you enjoy this recipe for Persimmon Goat Cheese Tartlets! What’s in this mini tart recipe? Fuyu Persimmons are sweet and round, but slightly flattened (like a donut) in shape pale orange fruit both in skin and flesh that can be eaten raw or cooked. These persimmons are in-season from mid-fall and throughout the winter months (October to February). The texture changes from crisp to tender and jelly-like as it ripens, but it is sweet tasting throughout. I used a crisp young persimmon in this recipe and opted not to peel the skin as it’s thin, edible, and mild in flavour. Have a taste of it with the skin-on before deciding whether or not you would like to peel it. The other common persimmon variety is the Hachiya: These acorn-shaped persimmons are astringent in flavour unless ripe or better over-ripened as they taste better (sweeter) when they are extremely soft. As a result, fuyu persimmons are highly preferred for this recipe. Puff Pastry are crispy puffed layers of buttery deliciousness. Store-bought puff pastry is a lifesaver and extremely versatile. This dough is great as a base for all types of sweet and savoury recipes. We always keep an emergency package in the freezer just in case we need a quick appetizer or meal such a Roasted Broccoli Potato Sausage Tart. Remember to de-frost frozen puff pastry overnight in the refrigerator. If you forget, you can thaw puff pastry at room temperature for 20-30 minutes until pliable, but check often as it can easily get too soft and sticky because the butter in the dough will start to melt. In both cases, do not unroll the puff pastry until fully thawed. In relation, when working with puff pastry, you’ll want to work relatively quickly to prevent the dough from getting sticky and hard to work with. If this happens, you may want to place the puff pastry back in the refrigerator to allow it to firm up. 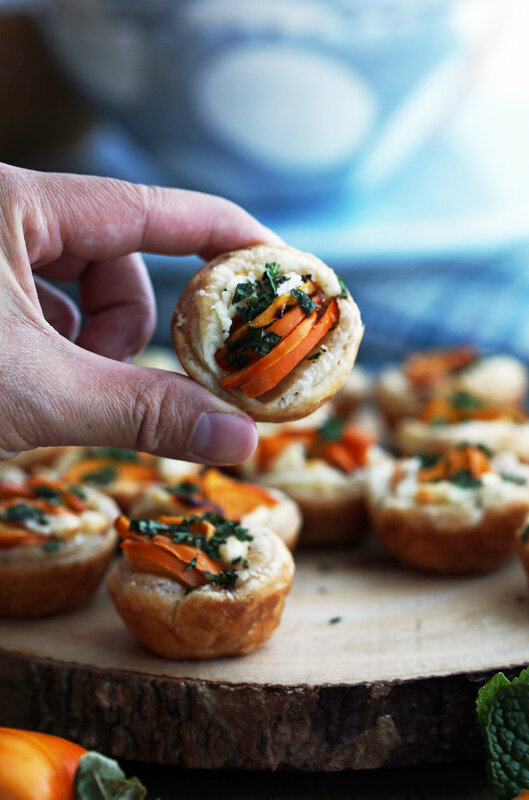 The tartlets are filled with soft, unripened goat cheese mixed with pure honey which creates a creamy, tangy, and lightly sweetened mixture that complements the sweet fresh persimmons. After the tartlets are baked, these tasty bites are finished with a light layer of salt and pepper (it helps accentuates all the flavours) and chopped mint, which gives these bites a little fresh, bright flavour. How do you make these tartlets? Slice a persimmon fruit into thin pieces. Full ingredients amounts and complete instructions available in the recipe card down below. Cut out 2 1/2-inch rounds of (1/4 inch thick) puff pastry before placing each round in a greased mini muffin pan. I use one with 24 muffin cups. Poke the center of each puff pastry with a fork a couple times. Then, fill each puff pastry shell with one teaspoon of goat cheese before placing persimmon slices into the goat cheese. Bake at 400 degrees F for 20-24 minutes until the puff pastry is golden-brown. Top with a pinch of salt and pepper as well as chopped fresh mint. Best served warm. Enjoy! Delicious: Sweet persimmons, tangy goat cheese, buttery flaky puff pastry, and fresh mint is one tasty combination! Texture-rich: Crispy, creamy, and tender textures with each bite! Easy and quick to prepare: This recipe uses few ingredients and the process to make these tartlets is uncomplicated. A cute appetizer that’s perfect for holiday entertaining! It makes 22-24 bite-sized colourful tartlets that stand out on a holiday platter. Can be made ahead of time: Make this appetizer a few hours or the day before. You can reheat at low temperature in oven or in the microwave or serve it a room temperature. Did you try this recipe? If you did, please leave me a rating and comment down below or tag me on any of my social media. I’m @yay_for_food on Instagram. I’d love a picture! Check out these other appetizers! Preheat the oven to 400 degrees F. Grease a mini muffin pan using cooking spray. In a medium bowl, combine the goat cheese and honey together. Set aside. On a flat, clean surface, flour and roll out the puff pastry into a 10x10 inch square or ¼ inch in thickness. Using a round 2½ inch cookie cutter *(see first note), cut out the puff pastry and place in the mini muffin pan. Repeat the process of flouring, rolling, and cutting out circles to use up the puff pastry. Using a fork, pierce the bottom of each tartlet shell a couple times **(see second note). 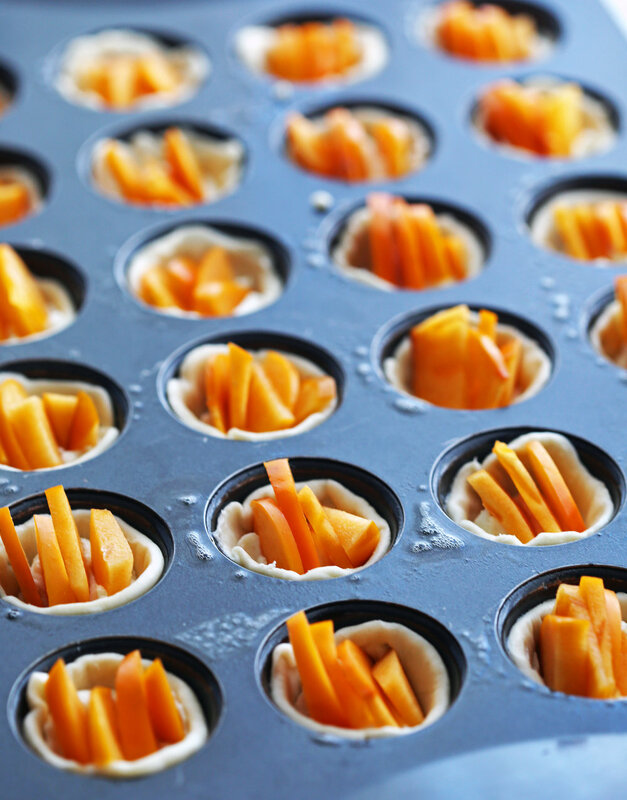 Then fill each tartlet shell with one teaspoon of goat cheese before sticking persimmon slices into the goat cheese. Bake for 20-24 minutes, until puff pastry is puffed and golden-brown. Sprinkle each tartlet with a small pinch of salt and pepper. Finish with fresh mint on top. Best served warm. *I actually used the rim of a 2½ inch wide drinking glass (see prep photos), but a cookie cutter would be easier. The puff pastry cutout should just be slightly larger than the widest part of the mini muffin pan. **Piercing each tart prevents the bottom from over-puffing when baking in the oven. Nutritional information represents one tartlet for a total of 24 tartlets.